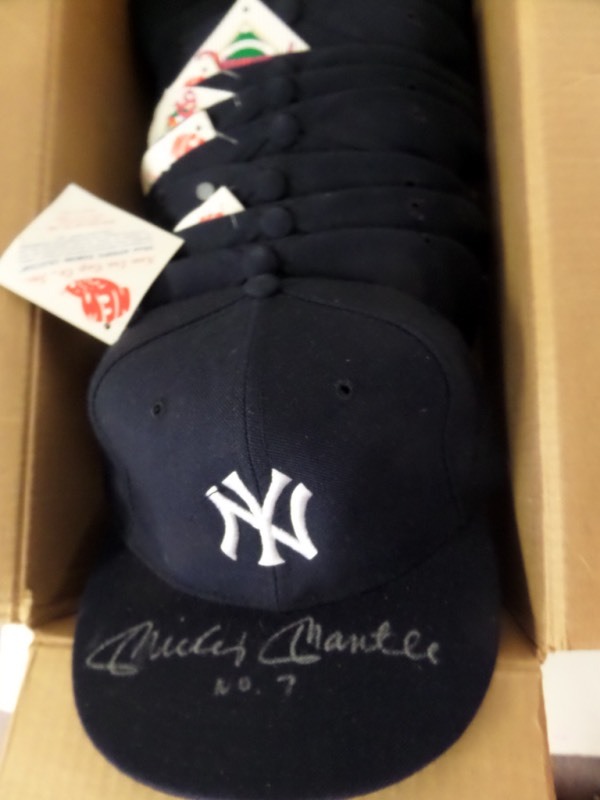 Coach's Corner - (10) Mickey Mantle hand signed/inscribed NY Yankees caps! Go Back to Lot List (10) Mickey Mantle hand signed/inscribed NY Yankees caps! This amazing opportunity is perfect for dealers ... or somebody with a lot of friends who are Yanks fans! It is TEN fitted navy blue New York Yankees caps, each still with original New Era Diamond Collection tags affixed, and EACH is brilliantly penned in silver on the top of the bill by Yankees all time great, Mickey Mantle! Fantastic-looking signatures here, each grading from 7-9, and each including his No. 7 inscription as a bonus! Just one of these babies can retail into the mid hundreds by itself, and we're starting you out with a $3.00 per hat minimum! Some serious coin can be made here!! !